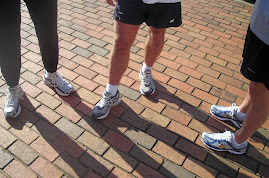 The 2nd Annual Jingle Bell Jog was December 3, 2010 at Athens High School. This is one of 3 annual 5k races in Athens. The Jingle Bell Jog benefits the Athens High JROTC. The event grew from last year. The weather was perfect for running! Tate Carden of Athens was the overall winner in 18:46. Lance Perry was the masters winner in 20:41. The overall female winner was Whitney Hollingsworth of Elkmont in 22:03. The masters female winner was Ruth VanZandt of Arab in 23:09. The majority of the finishers were Limestone County finishers, so I'll direct you to the results instead of posting the Limestone county finishers here. Here are the age group results. Thanks to Mark Humphries for making these results available so quickly!